First of all, I’ve retooled my blog a little and added lots of stuff to the sidebar. I added a link so you can subscribe to my blog feed with Bloglines so go check it out! I also moved all my links from BlogRolling to Bloglines, which is just so much nicer. Here are some action shots of Beatrix in that Debbie Bliss jacket from Special Knits. 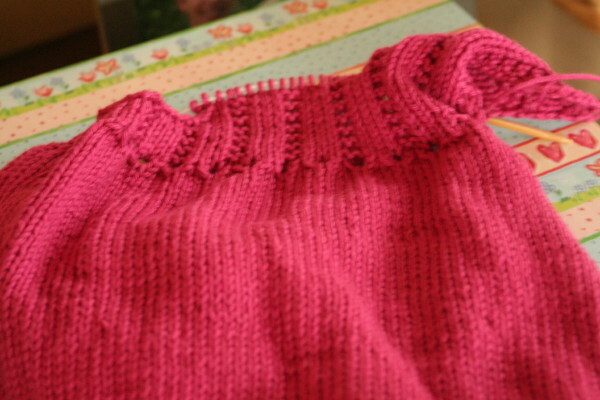 It’s knit with Cotton-Ease – have you heard it’s coming BACK????? YES!!!!!!!!!!!!!! I’m so excited about that. Cotton-Ease was the only decent yarn Lion Brand ever made. In any case, the jacket is cute but I just can’t figure out if the collar is supposed to stand up or fold over. It’s a little awkward, as you can see. Here is a progress pic on the pink tank dress I’m working on. My knitting group met yesterday so I got lots more knitting done than I normally would have! Finally, I thought I’d post some non-knitting pictures. I try to keep non-knitting content (NKC) to a minimum but I’m throwing in some garden pics. We had our first hard frost last week so Aaron harvested all the green tomatoes he could. I wonder how long it will take them to ripen? 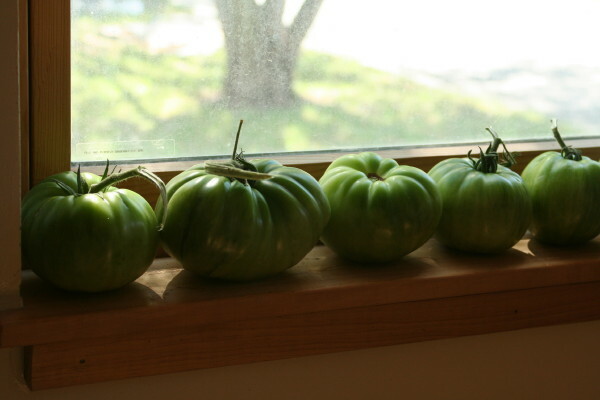 We have four window sills full of them – enough for one last batch of spaghetti sauce. The second picture is from the garden before everything died. Can anyone identify this??? 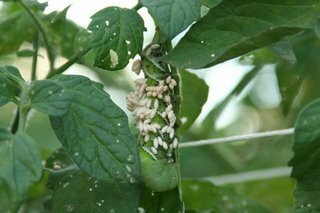 It looks like a really, really, really well-fed green caterpillar munching away my tomato plants but WHAT are those nasty white things? Larvae of some sort, I assume… From the caterpillar or some other bug? Any gardeners out there? Great sweater! Beatrice looks so sweet in it. What a beauty! And lets give a big WOO HOO to lion brand! They had to bring that yarn back because everyone EVERYWHERE was craving it! I like the tomato shots and ICK no idea on the baby bug larvae stuck to the fat caterpillar! 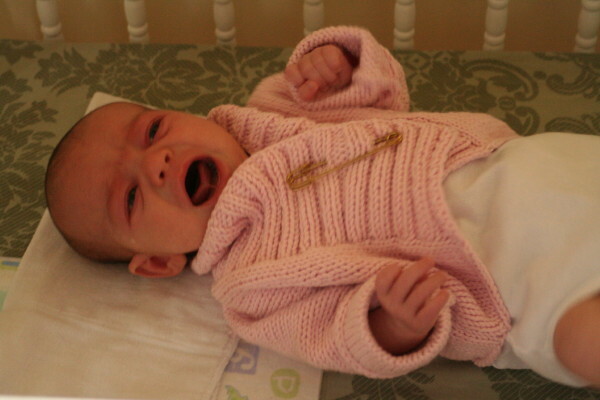 That pink sweater looks adorable on Beatrix…btw, loved the fart pictures. I don’t know what the white creepy crawlers are; but, I also have a windowsill of tomatoes. This is my first year gardening so I don’t know how long it takes for them to turn red…mine are still green after two weeks. 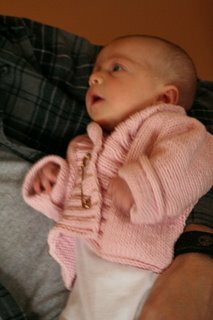 I just loved the baby sweater. The edging was really nice, too. I believe those white things are eggs. Probably from a white moth. I occasionally get them, but a dusting of “Seven-Dust” usually prevents them from hatching and eating everything in the garden. Your baby sweater is gorgeous! Check out http://www.colostate.edu/Depts/CoopExt/4DMG/Pests/tomato.htm for more info. To get your lovely green tomatoes to turn red, place them ( 3 or 4 at a time) in a brown paper bag and twist to close. Depending on how green they are, the tomatoes will ripen in a week or two. You can place them in a cool, dry place for this process – not in the fridge or the sun.